1.Sprinkle chicken with Fiesta, Teriyaki-Pineapple or BBQ-Corn dry seasoning and place in 3- to 4-quart slow cooker; pour Fiesta, Teriyaki-Pineapple or BBQ-Corn ingredients over chicken, making sure chicken is covered. Cover and cook Fiesta or BBQ-Corn on high 3 to 4 hours (low 6 to 8 hours), or Teriyaki-Pineapple 2-1/2 to 3 hours (low 5 to 6 hours) or until chicken is very tender. 2.Transfer chicken to large bowl; shred with 2 forks. Return chicken to slow cooker; stir to combine. 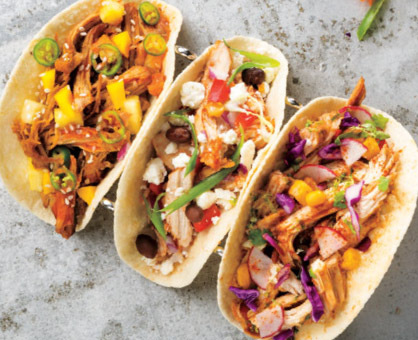 Serve chicken mixture in taco shells with your favorite toppers, if desired.